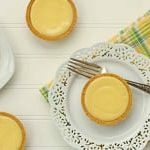 An easy recipe for lemon pie tartlets. Fresh lemon juice and zest give the tartlets fresh flavor. In a medium bowl, whisk together the sweetened condensed milk and egg yolks. Stir in the lemon juice and zest. (The more zest the stronger the lemon flavor). Fill the tart shells with the lemon filling mixture. Bake the tartlets for 15 minutes. Cool tartlets to room temperature and then refrigerate for at least 2 hours. Serve and enjoy!